Mega Man Xtreme 2, known as Rockman X2: Soul Eraser (ロックマンX2 ソウルイレイザー, Rockman X2: Soul Eraser?) in Japan, is an action-platformer developed by Capcom for the Game Boy Color. It is a spin-off title in the Mega Man X series and is a follow-up to Mega Man Xtreme, released the previous year. In 2013, Mega Man Xtreme 2 was made available on the 3DS Virtual Console of Japan's Nintendo eShop for the Nintendo 3DS. It was later released in the North American eShop the following year. 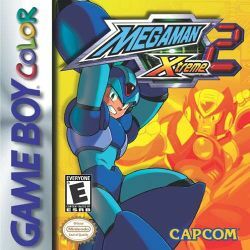 Mega Man Xtreme 2 is a similar take on the series' gameplay formula while combining elements from home console versions of the Mega Man X series. The player may choose to play each of a series of stages as either protagonist, X or Zero. Defeating the stage's boss will earn that player character its special weapon. The Mega Man X universe is set within the 22nd century, where humans and intelligent robots called "Reploids" live amongst one another. A tumultuous coexistence, some Reploids go "Maverick" and exhibit violent and destructive behavior. To extinguish such activity, a taskforce of "Maverick Hunters" is established by the human scientist Dr. Cain. The series chiefly follows the adventures of the Hunters Mega Man X and Zero, who have saved the world from the Maverick leader Sigma numerous times. Mega Man Xtreme 2 takes place between the events of Mega Man X3 and Mega Man X4, during which X and Zero, with the aid of their new friend Iris, are sent to investigate erasure incidents on the mysterious Laguz Island. Reploids around the Earth have been losing their "DNA Souls", leaving them as useless piles of junk. This page was last edited on 31 March 2015, at 18:15.